Nelson to Collingwood (July 1805), Nicholas V:57. Collingwood’s servant Smith, on the morning of 21st October 1805. Sam, a seaman on board HMS Royal Sovereign at Trafalgar, October 1805. Baron Jeffrey de Raigersfeld, The life of a Sea Officer (published 1830). Landsman Hay, Memoirs of Robert Hay (published 1953). 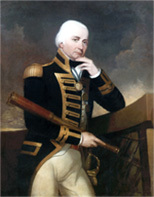 A fellow Admiral, who had called on Collingwood and been directed to the garden, where he failed to locate him for some time: Newnham-Collingwood 91 (published 1828). Lord Eldon’s anecdote book (1824-7). Newcastle Courant, Sat April 21st 1810.